What’s wrong with this photo? Is the color off? No, I wanted it to look that way. Is there too much contrast in the photo? No, I wanted it to look that way too. Wait…Fred Durst is not wearing a baseball cap…did he forget his hat? No, I wanted him to look that way. But it wasn’t easy. Limp Bizkit had recently released their debut CD, Three Dollar Bill, Yall$ and the sales were off to a slow start. 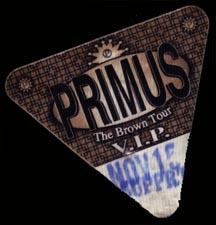 At the time, the band was a touring machine, and were currently main support on Primus’ The Brown Tour. 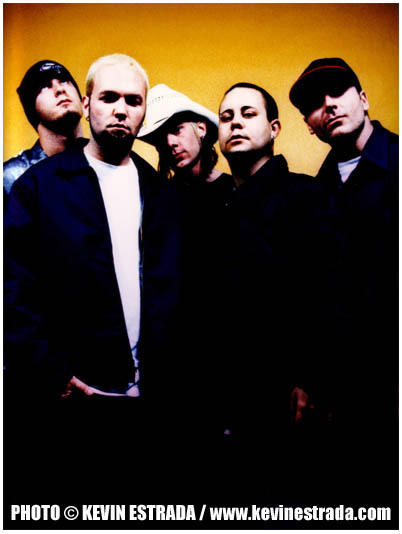 Touring is what was eventually going to break Limp Bizkit and make them one of the biggest rock bands in the world. I hooked up with the Limp guys at the Palladium in Hollywood. 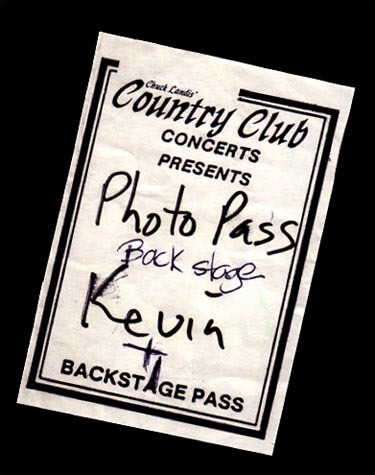 Time and space were tight that day, so I had to set up just a few feet away from the stage and shoot the session as Primus rolled through their soundcheck. Before we started shooting, I chatted with the band a bit so we could loosen up, get to know each other a bit. The guys were very confident, borderline cocky as they told me that they were a unique band and there was no other band like them. They went on to tell me that they wanted this photo shoot to be different than all the rest of the shoots they had been doing…for me to get creative and do something really different. Realistically there was not much I could really do – I had a colored backdrop set up on the floor of the venue…how creative can you get? I pitched the idea of creating a different color scheme for the band, one that was over saturated and extremely contrasty – more edge and less pop. They loved the idea. But I needed something more. I walked over to Fred and told him that he should lose the baseball cap he was wearing. He freaked out on me and told me there was no way he was doing a photo shoot without his hat. No way. I pulled Fred aside and told him that he needed to trust me. Fred was ready to walk. Then I said, “I thought you guys weren’t like all those other bands, I thought you really wanted something different…something that matched your music.” He looked me in the eye, raised an eyebrow and removed his cap. The result was a very rare Limp Bizkit photo session, one that I truly believe is unique and not at all like the rest of the shoots the band had done prior to my shoot or even afterwards. Photographed with my Canon EOS1, a Canon 28mm-80mm 5.6f lens, and a small Novatron strobe kit. Shot on Kodak film. 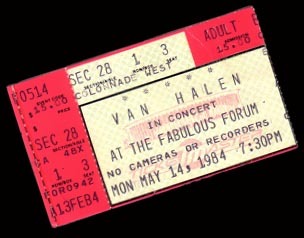 Part three of a five-part series that I am doing this week on local L.A. bands in the ‘80s that were opening acts on some big gigs at my favorite venue as a kid – Perkin’s Palace in Pasadena California. Odin was fairly new to the L.A. rock scene, but they rapidly built a strong and legitimate following around the rock circuit. Their street cred became undeniable, quickly getting the band added to the big shows – like this one at Perkin’s Palace. At this point, Odin had just recorded their first 7” single, Caution (which I bought that night at the show for $2.00). Despite the homemade artwork and misspellings on the single, Odin looked like a band on the verge. 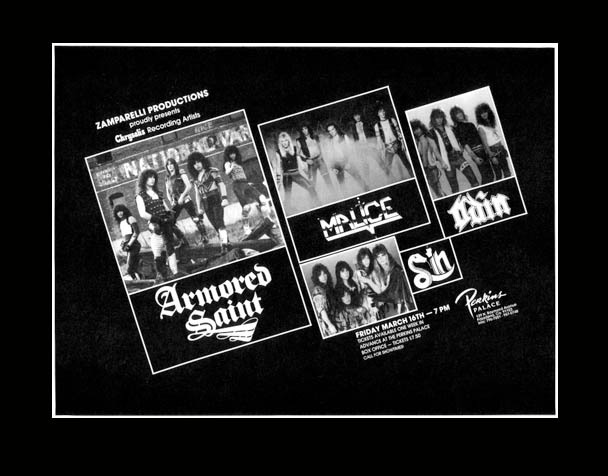 From 1983 through 1985, Odin’s sound was heavy and fast – pulling influences from bands like Armored Saint and Metallica, but adding the Blues elements of Aerosmith and Van Halen. Odin’s opening act days were numbered, and the band soon found themselves headlining most of the rock venues in Los Angeles. I was a big fan of this band, their early material was the perfect combination of chuggy guitar riffs and melodic metal hooks mixed with raw, punk rock production. Their 7” sounded like it was recorded in a basement for $10, but this was the perfect sound for this band. After their first full release, Don’t Take No For An Answer in 1985, I – along with many others – lost interest in Odin as the the band became influenced by the early stages of “hair metal.” Odin drastically changed their sound, their live show, their clothes, their hair, and their overall outlook on music. 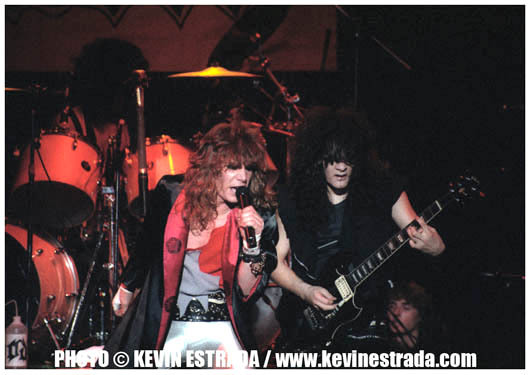 I was pretty bummed out that a solid, quality band would give in so quickly and jump on the “hair metal” bus, especially after working so hard to gain the respect that they had built. But, for every one of me that they lost, I am sure they gained two or three “hair metal” fans…but that was not my thing. Legendary club owner,Bill Gazarri, proclaimed that Odin would be bigger than Van Halen, but Odin’s potential remained unfulfilled. A major label deal failed to come their way. But it would be their appearance in The Decline Of Western Civilization Part 2: The Metal Years, that would turn the band into cult metal heroes or the laughing stock of rock, depending on how you look at things. Photographed with one eye on the camera and one eye looking over my shoulder on my trusty, smuggled in Canon AE-1 and a cheap, no name 70mm-210mm lens. Shot on Kodak negative film. 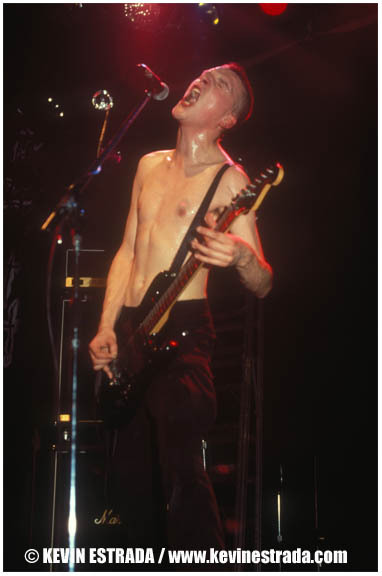 At this point in my life I was heavily involved in three music genres – the underground L.A. Rock scene – in which Jane’s Addiction was leading the pack; the early stages of what came to be known as Grunge – I was seeing bands such as Soundgarden and Mother Love Bone and of course Nirvana; and my new love at the time – Grindcore. Grindcore was a new movement in metal spearheaded by hostile bands such as Napalm Death, Terrorizer, Bolt Thrower and Godlflesh. At the time, I was still struggling to establish myself as a rock photographer, trying my best to have my images and my name printed in as many publications as possible. There was a lot of anticipation for this L.A. area show as it approached. I don’t know where they come from, but there would be masses and masses of death metal Latinos that would come to these shows – I’m talking hundreds of them. The violence inside and outside the venue started even before any of the bands hit the stage as three of the most notorious gangs in Los Angeles were in attendance. And to make things worse, they were all rivals. If that was not enough, add handfuls of concert-goers high on PCP / Angel Dust. I’m not kidding, this show was out of control. As each band played their sets and the night progressed, so did the level of violence. I began to notice that there were less and less photographers as the night went on. Just before Co-Headliner Napalm Death hit the stage, there was just me and the photographer from the Los Angeles Times left in the barricade. As soon as Napalm came out, a horde of kids rushed the stage…the stage was filled with dozens and dozens of crazy, violent kids, you could barely see the band – and they were using us as stepping blocks to get on the stage. 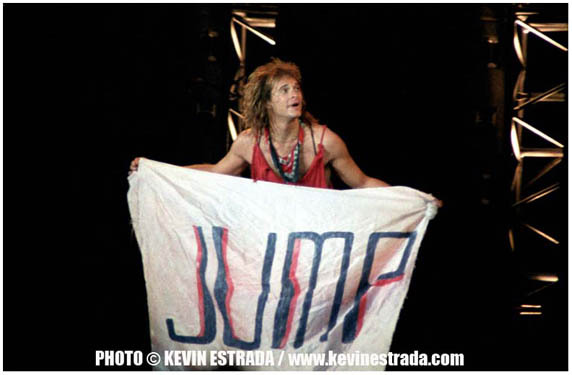 At one point, during Napalm’s first song, the L.A. Times photographer started freaking out, totally panicking. He started grabbing me and pulling on me. Then he started screaming that we needed get out of there. The venue was way out of control and he feared for his life – and mine. He must have thought I was nuts, because I was getting off on the chaos, my adrenaline was so high, I did not want it to end. I looked at him with a crazed smile and screamed back at him that I wasn’t going anywhere. He grabbed his gear and ran…I never saw him again. By the time Godflesh hit the stage, I was the only photographer left. I was either the bravest photographer that night, or the stupidest. I am sure it was a fine line between the two. My passion for the music just took over, and I was in it ‘til the end. I noticed that the PCP usage really kicked in during the Godflesh set. There were people freaking out, hallucinating and hurting people right behind me. As I was snapping Godflesh, I began to feel a cold, tingling sensation on my back. Every once in a while, I would need to scratch or rub my back as the sensation grew more and more frequent. A few songs later, I again rubbed my back, this time I noticed that the top of my hand was smeared with blood. I had no idea what was going on. Was it my blood? Was it someone else’s blood? Then I saw it. One of the kids, out of his mind on Angel Dust, had an exacto knife and had been slicing my back. The back of my shirt was in strips and I had about eleven bloody slices on my back. I started screaming at the kid and I knocked the exacto knife out of his hand with my camera. Just then, one of the other PCP freaks started biting the kid’s cheek. He then ripped a handful of hair out of his head and pounded him in the face until he was in a bloody daze. The whole scene was surreal to me…it was almost like Godflesh was playing the most amazing soundtrack music to the most out of control, violent, drug induced movie that I had ever seen. But this was not a movie, it was real, and it was exploding right in front of my face. Godflesh finished their set at about 2am and I was still standing, camera in hand. I went home, feeling like I had been run over by a bus, but I knew I got some killer photos. The next morning, my telephone woke me up. It was the publicist at Earache/Relativity Records – Godflesh’s record label. It turns out that the Los Angeles Times heard how out of control the show was and they wanted to do a story on the show and on the Grindcore movement – but they had no photos because their photographer bailed. I was the only guy with the photos that they needed. I tried my best to negotiate with the L.A. Times – I got a whopping $60 – I was lucky to get paid at all. Nevertheless, my photo and my name made it onto a full page in the Sunday Calendar Section – the biggest entertainment section that the L.A. Times runs. It was a huge success for my career and me. I might not have been paid very much, but this photo and this story gave me street cred that you just can’t buy. Talk about having to pay your dues. Photographed under the blade with my lethal Canon F1 and a cheap, no name 28mm-80mm f5.6 lens. Shot on Kodak Ektachrome film. Part five of a five part series I am doing this week that captures Amazing Screams. 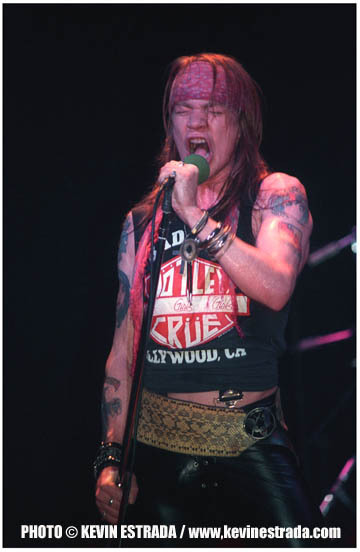 When Axl would scream, he looked like a baby bird wanting to eat. His whole body would convulse, he’d stomp his feet, squeeze the mic with both hands and get so totally into it, you thought he might spontaneously combust. His voice was so powerful it was like a new instrument that could carry its own melody and create its own little hook. This shot is from a four-night run they did at Perkins Palace just as Appetite For Destruction was beginning to take off. 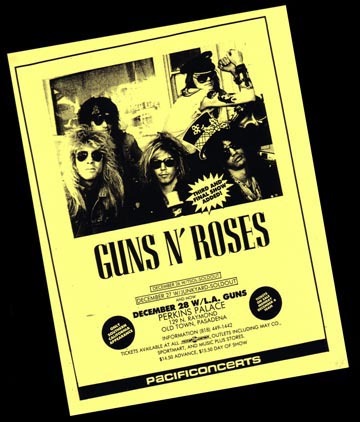 Right after this GNR went on a big arena tours, opening for Aerosmith and The Cult. This was the last time we got to see them in a theater,they soon became huge and were headlining the big stadiums themselves. Photographed with trusty, smuggled in Canon AE-1 Program, a cheap, no name 70mm-210mm f5.6 lens. Shot on Fujichrome film.